PLEASE NOTE: We found the Node-Red system with its visual design system to be another excellent way to set up a home automation system, and it is our current favourite. See OUR ALTERNATE ARTICLE SERIES on how we control blinds, lights, window openers and many other devices with Alexa™, using Node-RED and Alexa™ on the Raspberry Pi (Node-RED comes pre-installed on the Pi). The Raspberry Pi ® is a very affordable, credit-card sized SBC (Single Board Computer) that makes a very effective home automation system when used with Stefan Stromberg's OpenNetHome automation software, as discussed in the previous article. Please note that this system does not require an external Internet connection to operate, so if you are concerned about security, this is a good choice. You can access it remotely with an Internet connection, but that functionality is optional. This article will discuss the process of creating devices for remote control of our shade and blind motors, window and skylight openers, and other items. The devices can be subsequently placed on the plan view, as seen in the picture below. You can also have multiple plan views if you want to focus in detail on a particular area or room in your floorplan view; the next article (part 5) will explain this capability in depth. 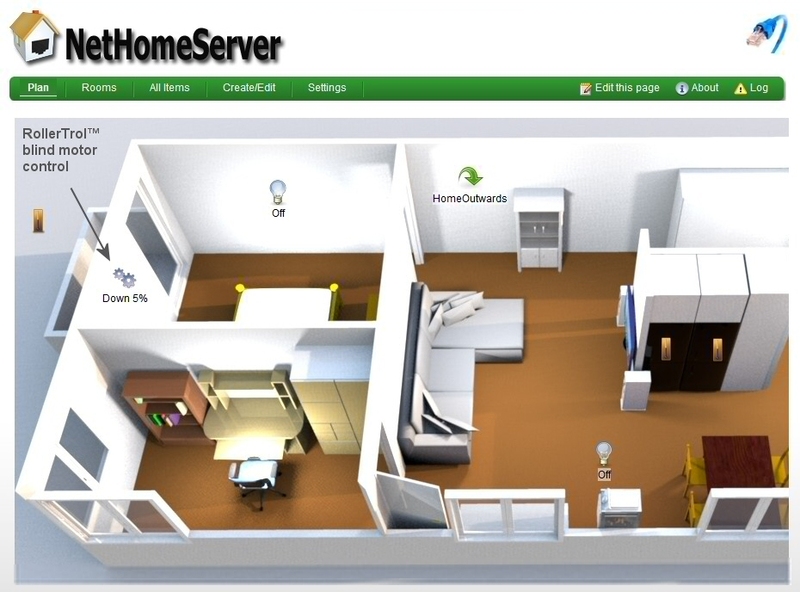 The above picture is an actual screen capture of the home plan view (running on the Raspberry Pi). 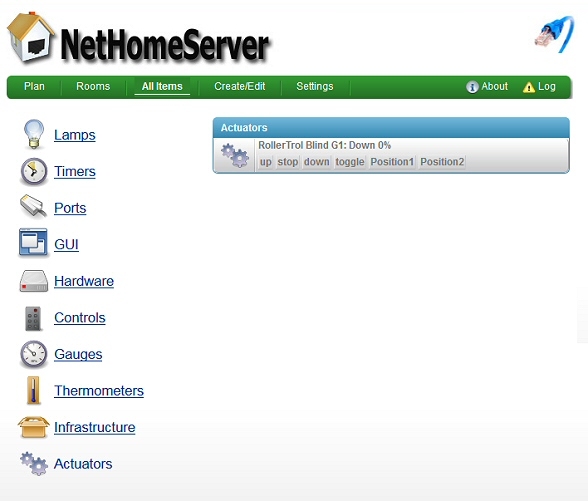 Note that the OpenNetHome system has the ability to display the state of the blind, whether it is fully opened or closed, or part way (Down 5% in picture). This is accomplished by entering the actual measured excursion time, so that the system can calculate the position. It is re-set whenever it reaches an upper or lower travel limit. The first step is to implement device creation for the 433 MHz USB transmitter dongle that sends the radio signals to the addressable receivers used for our motors. We are using the Jeelink product from Jean-Claude Wippler's excellent Jeelabs product line, sold in the US by Modern Devices. There are 2 versions, please choose the Jeelink Classic Version (433 MHz, RFM12B chip). Please note that the screen captures below may be slightly out of date as Stefan's software evolves. Click or select Create/Edit from the main menu. 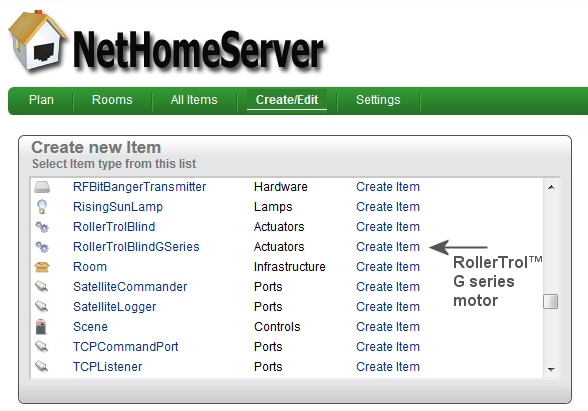 This will display a list of available devices that can be created, as shown in the picture at right. 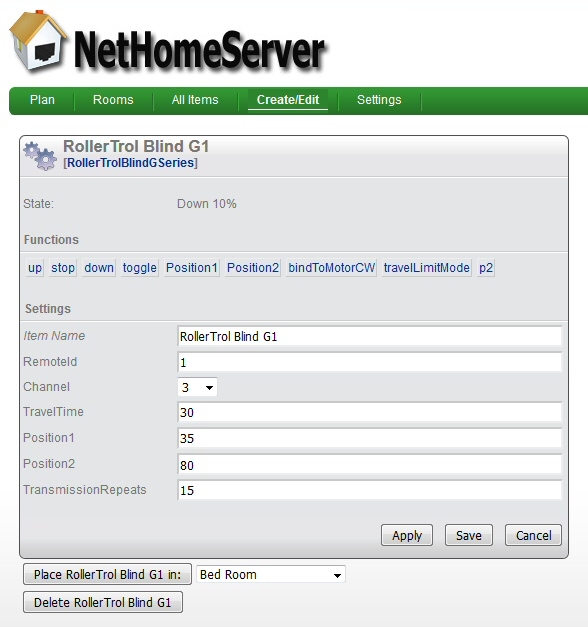 Scroll down until you reach the RollerTrol Blind Motor selections. You can select our original R series protocol type, or the newer G series. For the purposes of this article we will use the G series. Please note: G series selection will also work with our window and skylight openers - they use the same remotes. Click or select Create Item, this opens the next screen. You can think of this configuration as just another remote control; it behaves in a very similar manner as our hand held and wall mount remote controls. For the purposes of this article we are going to assume that you have already created a master channel with a regular hand held or wall mount remote control. This will allow us to simply clone the master channel to the automation system. Note that only the master remote can set travel limits. You could do it the other way around - configure this as a master channel, and clone it to a hand held or wall mount remote. This article explains how to create a master channel. When you have entered all the properties, you can press the SAVE button and proceed with the cloning process. Make sure the REMOTE is set to the master channel you want to clone; the next actions must be completed within 6 seconds of each other. Press and release the P2 button TWICE on the REMOTE that holds the master channel, the motor will beep once and jog each time. Press and release the P2 button ONCE on the OpenNetHome screen, the motor will beep 7 times and jog. At this point, you are finished - the UP/STOP/DOWN/TOGGLE buttons will work, and the travel limits will not be changed. When you have confirmed the operation, you can press the SAVE button to complete the process. If you prefer that the automation system is the master channel, this article explains the process of creating a master channel. The control panel for the motorized item (blind, shade, window/skylight opener, etc) will appear on the right hand side of the screen. You can operate it manually with any of the control buttons. Click or press the name of the device and the settings dialog will appear. Please Note: Our blind motors and window openers are operated with wall mount and hand held controls, and our system is designed to allow automation to be added at any time. This means you can start with our simple remote controls and add the automation later, and take your time with it. Our remote controls will continue to function while you build your automation system and will also continue to function after the automation is activated. You can find out where to buy the Pi 2 Model B unit by searching for this phrase: "buy a pi [country]"
We sincerely hope you enjoy using these articles; if you have any questions, please feel free to contact us at any time!